This "Historically Speaking" column was published in the Exeter News-Letter on Friday, June 22, 2018. By the summer of 1775, it had become increasingly obvious that the American Colonies were on the brink of revolution. New Hampshire moved its capital from Portsmouth to Exeter in July for security and the towns began sending representatives to create some form of government amid all the confusion. A temporary constitution was adopted the following January creating a representative legislature with an elected president. From this body, a Committee of Safety was appointed to manage affairs when the legislature was in recess. With all of this activity in town, it’s easy to wonder where exactly it all took place. There was a ‘town house’ (today we would call it a town hall) standing near the corner where Court Street would later enter Front Street. The legislature met at the town house, but the various committees and sub-committees needed places to gather. There were a few local taverns that were welcome places to meet – particularly because food and strong spirits were available – but sometimes an official meeting was interrupted by public engagement. 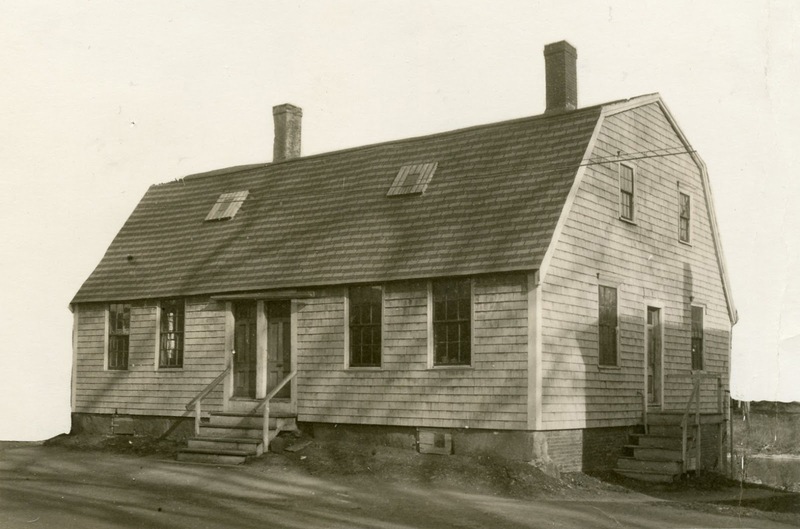 Sitting in the town square, was a 2-storey gambrel roofed house belonging to Joseph and Rebecca Gilman. It had been built in the early 1700s by Joseph’s grandfather. Joseph, born in 1738, was one of three surviving sons of the Reverend Nicholas Gilman, who died when Joseph was only 10. His eldest brother, Tristram, was given a Harvard education and like his father became a minister. Joseph and his remaining brother Josiah received more basic instruction and at the young age of 15, Joseph was sent to work in a counting house in Boston. He married in Boston at the age of 22, but his young wife lived only a year into the marriage, dying of smallpox. Joseph returned to Exeter and with Josiah and their friend Nathaniel Folsom, became partners in a business that dealt in lumber, ship building and importing. He met Rebecca Ives, a distant Gilman relative, in 1761. She was well educated for a woman of this time, speaking fluent French and with a taste for fine literature. The two were married a few years later and they moved into the old house on the town square. Despite his lack of formal education, Joseph was very active in politics. He served as a town selectman and when the revolution began to percolate, he was involved in drafting correspondence. During the war years, he was part of New Hampshire’s early government, serving on the Claims Committee and the Committee of Safety, which met at his house. Rebecca was there to serve as hostess – it is said that Samuel Adams was entertained in the old house. Whenever French officers arrived in town, Rebecca was called upon to serve as greeter and translator. Joseph worked closely with his kinsman, Nicholas Gilman, Sr., who was serving as State Treasurer during the war. After hostilities ended and New Hampshire adopted a permanent constitution, Joseph was elected to the state Senate and served on the Commission of Continental Accounts to pay off the debts incurred during the war. Unfortunately for Joseph, his own debts piled up. The lumber and ship building trade declined in Exeter in the post war years. Worried that his debts might cause local embarrassment, he packed up with Rebecca and their only surviving child, Benjamin and headed west to Ohio in 1788, where he bought a farm and continued a life of public service. A later notice in the Exeter News-Letter, titled “Exeter in the West” told the story this way: “Mr. Gilman’s business suffered through over devotion to public affairs, and through the general embarrassments of the times, and after the war had ended he found himself on the verge of bankruptcy. In those days the debtor was imprisoned and all his furniture and other belongings would be sold with the exception of a bed for every two persons and a few articles of clothing and tableware. He felt that if he had time given him he could pay all, but his creditors showed ominous signs of impatience. His wife, a woman of more than ordinary talent and tact, one day announced to her friends that she was behindhand in her calls and meant to finish them all up. She did so and was specially agreeable to the persons whom she visited. A few nights later and the family had disappeared.” Benjamin would later return to New Hampshire to seek payment for the services his father had performed for the state during the war. He was able to secure a modest amount, but by that time, Joseph was serving as a state judge in Ohio and was no longer feeling the embarrassment of financial woe. The house on the square wasn’t able to get a second chance. By 1855, it was known as the “Dean House” for its then owners. The Town of Exeter needed the property to build the new town hall. 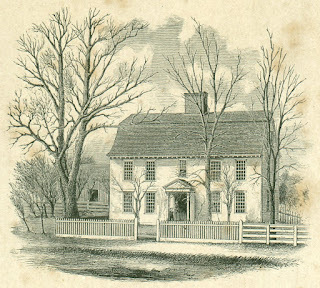 An account of the house written by Frances Moulton tells us, “the land was purchased by the town, and the lower story of the house, being greatly out of repair, was cut away when it was removed to Franklin Street.” For the next hundred years, the house was used as a tenement, split into a duplex. Few knew about its historic past and by the early 20th century it had fallen into disrepair. Allowed to deteriorate further, and having become something of an eyesore, it was torched by an unstable individual in 1941. The property was uninsured and, after rescuing a bit of “valuable paneling” was razed. Accounts of the fire identify it as “the old Dean house” “a Colonial style, two-family dwelling” without mentioning its importance to New Hampshire during the American Revolution. 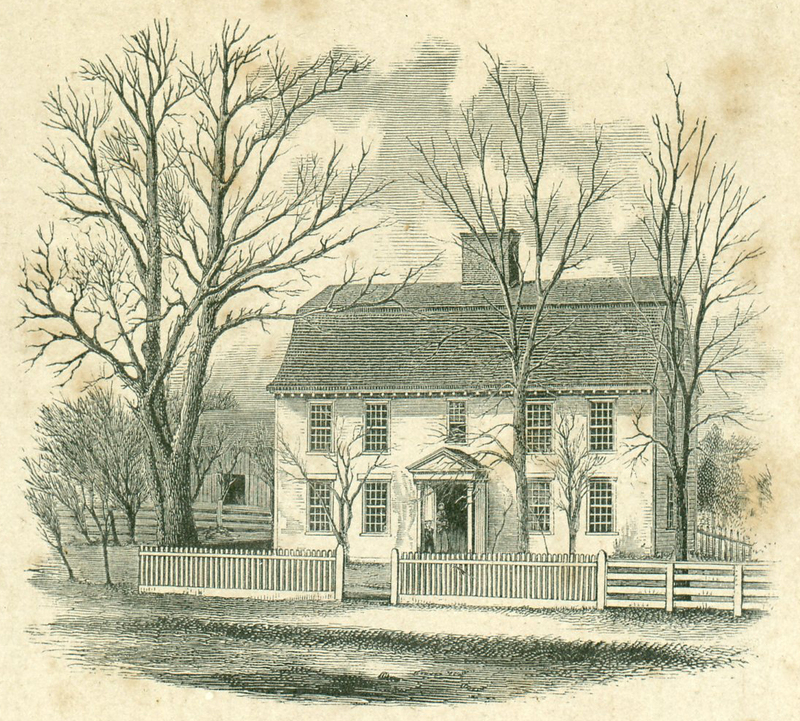 1st image: This small engraving of the Gilman Dean house, donated to the Exeter Historical Society by the American Independence Museum, depicts the house as it proudly stood in the center of town from about 1724-1855. The New Hampshire Committee of Safety met her to discuss troop recruitment and other military details during the American Revolution. 2nd image: In 1855, the town purchased the land to build the Town Hall. The house had its first floor removed and was moved to Franklin Street, where it was converted into a tenement. It was destroyed by fire in 1941. This photo was probably taken in the 1930s. Flag Day, When is that again?